Hook has been one of the more delightful character reinventions on Once Upon A Time. Turning the classic villain into a swaggery anti-hero, now a tortured romantic, is one of the most successful character transformations this show has taken on. The episode title “The Jolly Roger” refers to Hook’s efforts to get his boat back, his true love, but really the vessel is just a stand-in for his actual true love, Emma, who—due to yet another unfortunate curse!—seems farther away from him than ever by the end of the episode. Fortunately, the emergence of Killian’s softer side has infused the show since Neverland: all his efforts to save idiot Charming from the Nightshade; his fondness toward Baelfire and Neal, his grownup version; his attempts to find Emma’s son. Now Hook’s having fun spending time with Henry, of all people, but at least he’s teaching him how to “borrow” boats and cheat at dice. 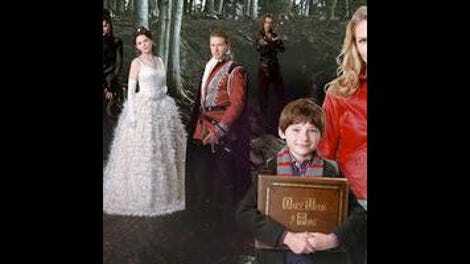 In the Hook backstory “Good Form,” we learned that Killian started as a law-abiding citizen until he was deceived by his king, resulting in the death of his beloved brother. Throughout Hook’s character, we see glimmers of the hero he once was, now masked by the scoundrel personae puts on. All of which makes his decision in “The Jolly Roger,” choosing his ship over the life of Ariel’s Prince Eric, all the more agonizing, so that it’s understandable why he would still be tortured over it months later. Egged on by Ariel and accompanied by the no-longer-rodential Smee, Hook goes after Blackbeard to win back The Jolly Roger, in a sword fight that frankly could have been a bit more epic. Blackbeard will either give him Eric back or his ship, not both. Rapidly losing his street cred due to all his Charming family hangouts and fighting against the love for Emma that has claimed his heart, Hook goes for the more pirate-like option by choosing his ship over a life. He almost immediately regrets it, and confesses all to present-day Ariel. Alas, she is actually Zelena in disguise. (You must be hungry after not being in the episode until the end, Zelena! Here, take some scenery to chomp on.) She tricks him into saying his love’s name out loud, so that now he must either kiss Emma and make her magic disappear, or the Wicked Witch will destroy everyone she loves. Unfortunately, the rest of the “The Jolly Roger” was not nearly as compelling as Hook (a lot of this credit goes to Colin O’Donoghue, who makes the most of these smoldering scenes, and is one of the few people in romantic torture on the show who does not cry out for a thunk on the head). Regina tries to train Emma Karate Kid-style in the art of magic. When Emma scoffs at reading a book that’s in elvish language (well, half-elvish), Regina takes the “throwing in the deep end” approach. Granted, Regina does have an awesome expression when she fears she’s let Emma plummet to her death. Apparently, Emma possesses great, yet untrained and unbridled power. Which seems awfully convenient at this point in the story, and does that in fact make her a witch now? In one of the most asinine plots OUAT has ever pulled (which is really saying something), Snow and Charming, hurt that Henry finds them too boring to hang out with (Delusional Snow: “Oh, we’re fun”), try to come up with some fun activities for him. Instead of teaching him archery or something, Charming decides to let Henry drive his truck. On a street. With other cars and people on it. While saying, “It couldn’t be safer.” When, in fact, it could be safer in so many ways! How about strapping on a seat belt? No, the episode crown definitely goes to Hook, even as he’s embroiled in yet another convoluted OUAT plot. Zelena apparently has eyes and ears everywhere, so she knows that Emma is building up her magic, just when the witch needs to find a way to rob her of it. So just as Emma is warming toward Hook—what with the demise of Neal and Hook’s wooing of her son and his constant devotion to her since Neverland—he becomes the instrument of her doom. He then heads straight to the Charmings’ apartment, presumably to tell them about the curse. But after he runs into Emma instead, is she better or worse off if he spills his secret? Her odd, cobbled-together family then heads out for yet another meal at Granny’s (where Henry gets his second fried food platter of the day) while Hook pines from the outside. In Storybrooke, of course, it would have to be no mere romantic obstacle between these two. But Hook’s strong devoted buildup over the course of a year (remember “when you come to me, it will be because you want me”?) hopefully means that the eventual payoff will be worth it, witch or no witch. The musical cues on this show just seem really over the top lately, like when Hook finds Eric’s cloak in Gold’s shop, it sounds like he’s discovered the Holy Grail or something. The mysterious Holy Grail. One of the lamest moments in the lame Blackbeard sword battle: Hook drops a sail in front of the crew so that they can no longer see the fight. Then they just silently stay behind the sail instead of going under it or around it to see what’s going on. But the shadowy shots of the swordfight on the sail contain a nice Peter Pan nod. Everyone seems really concerned about having someone with Henry at all times, yet at the beginning of the episode, he’s just off at the store by himself, while that witch is still flying around. Storybrooke retail signage: Traditional Brick Oven Bread.